finding the parts you need for your favorite range. Send: pictures of your stove and part(s). If available, Send: Part style and model. unless requested. WE DO NOT CARRY WOOD STOVE OR COAL STOVE PARTS. Because this is a FREE service in test mode, only e-mail or letter requests will be responded to. Clear pictures of the parts and measurements must be included - NO EXCEPTIONS. Please, do not call before sending pictures and part details. Allow approximately one to two weeks for return response. 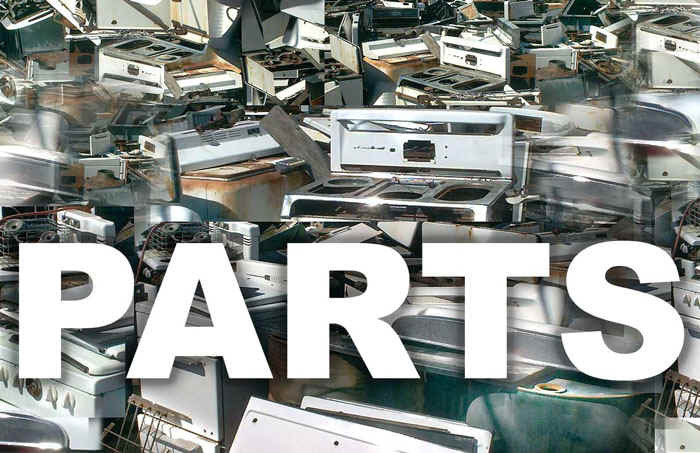 IMPORTANT: Not every part is available for every stove ever manufactured, however with 12 warehouses crammed full of new-old stock and used antique stoves and parts, the possibilities are excellent that we have what you need. WE’LL CONTACT YOU with instructions on how to proceed in ordering. We take all major credit cards for super fast ordering. SHIPPING – Shipping is available by UPS, USPS and Fed EX. include this request in your e-mail. ... Are there OTHER ALTERNATIVES I can use? A. If the part you need is not available and if you have the original part, there is a good chance that it can be restored or a new part can be fabricated for you. Whether it is a parts issue or a mechanical, electrical or cosmetic problem there is usually a work-around available. As a TOAC member you will also save $$$ on selected services, products and save on Display Ads. Members also benefit from a Free one year run of their worldwide Parts wANTED text ad! People have found this to be one of the easiest, most cost effective and quickest ways to access what they need. 1. Supply clear pictures and text copy. Or, place a Text Ad. 3. Then, send your buyer to TOAC for follow-up help on any appliance problems. After 34 years in business, we understand antique appliance needs completely. Plus, we will suggest the best way to present your ad to attract the greatest amount of attention. Antique equipment needs often demand a good, extended advertisement run and that is exactly why we offer a combined run of 180 days (6 months total). We take no commissions and there is just one flat fee. Ad sizes run from a business card size to full page display ad. Let us know your parts needs. anywhere in the field of old appliances. Call (805) 643-3532 or Email TOAC@sbcglobal.net for Assistance. TOAC Shop Parts, Services & Information Listing for Antique Stoves. PayPal users - please email us at toac@sbcglobal.net with your order. Get Help Instantly... we accept Debit Cards, MC, Visa, Amex, Discover and Diners Club too. Insurance Coverage or Signature Confirmation - Available Upon Request. Shipping and handling added to all orders. California orders will have tax added. 20% restocking charge for: incorrect orders, returns, or invalid address. Shipping is nonrefundable. All sales final on PDF and printed materials. Not responsible for orders placed or parts left after 30 days unless previously arranged. Receive the most requested up-to-date news on classic stoves and appliances. To get on the list instantly click on our mailing list icon - or read about the Communiqué here.